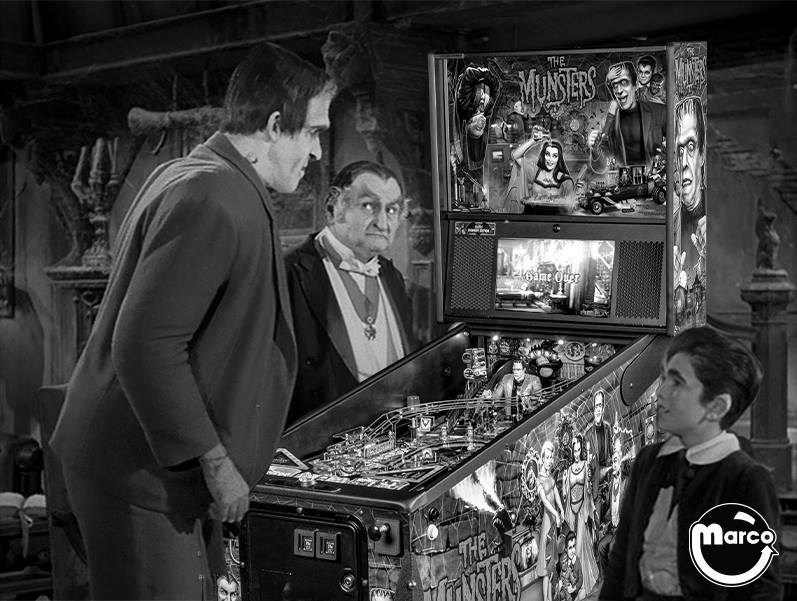 I am having several issues with my monte carlo pinball machine. The first issue I am so close to having fixed yet a new issue happened. So I tried attaching a photo lets hope it added. 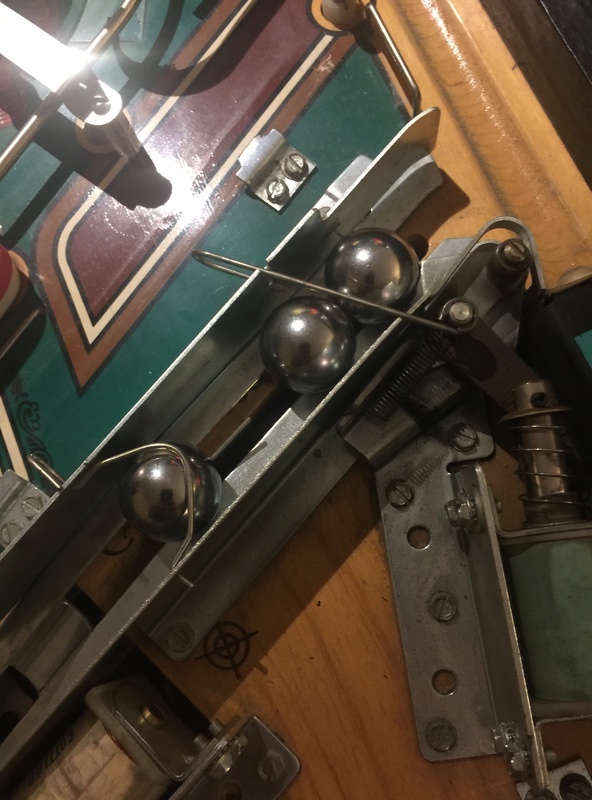 When the three balls are launched at the start up the third ball will smack the two and bounce back too quickly slipping under the metal wire catch. So I changed the angle slightly for the wire and it now falls before the ball can bounce back under it. However then I ran into the issue that the third ball would not sit over the switch needed to start up the game. So I got the wire frame back into its original position and moved the switch back. after much tweaking I got what I believe to be pperfect alignment so it should not happen again. However.... My game is now stuck in test mode. Like stuck in test mode. Shutting it off does nothing. as soon as I hit the start button it tells me in in test mode. I tried googling and I cant get out of test mode. Ive been in test mode before and gotten out with no issues. The machine just has the one small red button for test mode and the volume control. How can I get out of test mode and find out if my adjustments worked?! Next issue. The number 10 light will not work. it has a single wire attached to it and some lights have 2 wires but some have one. all the others work fine. when I hold the wire with my finger it produces a very weak connection so I assumed it much have a poor connection. So I cut the wire removed the old solder striped and soldered the wire again and nothing. its doing the same thing in exactly the same way. Last issue. The game features an epic 10 million point shot. it is randomly light up in the game at random periods. when it lights up a siren goes off and the lights go wild. but when you hit the ramp you are not awarded the 10 million point shot. the ramp has a switch for going up the ramp and going off the ramp. both create sounds and lights when activated so the switches are connecting and working. I see no option in the menus for enabling/disabling the feature so im not sure what I can do to make this shot work. I personally don't really want the shot as I feel the score board will be all about who got the most 10 million point shots and not who played the best game however id like to know the feature could work and I do have buddies who are dying to have the 10 mil point shot work. Any advice on anything mentioned would be greatly appreciated! The test mode thing has something to do with the door switches I believe.Coin door has to be closed i think? Inside the door is a small red button that toggle through the test options and the volume. I don't see anything like on the newer machines for a switch knowing the door is open. Maybe im not seeing it. When I run a test on the switches its saying my switch 13 is closed. I cant seem to find which switch is which. When I look online for the manual I find nothing. Is there anyway I can find a manual for this game? I bet its an easy fix that will bring it back to life. Is there any chance its not exiting test mode because its not completing the test or there is something that can prevent it from exiting text mode? BOOM! Lookie what I found! Is this what im looking for? Now what the heck does "8" wheel position mean? The 13 is the switch that my test is saying is closed. Found a thread on pinside pertaining to my exact issue! Well most likely. I don't understand fully some of the things these guys are saying. Can someone take a look at this thread and make sense of it for me? Whats a piggy back board? Well that switch matrix was helpful. The 13 switch I was confused by was the switch the ball was currently sitting in the roulette wheel. So feel like all my switches should be working ok. I seated and unseated everything in the backbox which helped my demo man one time. Nothing. The "piggyback" board seems fine to me. a tad dusty but connections seem to be fine. isn't loose or wiggly. I think I read everything on pinside that was a thread about fixing a monte carlo. On thread even said test mode stuck but I think it was a different issue. Another thing I read about is the daughter board. Could my issue be with this board? it seems it can be connected to start up issues but a bit differently then what I have. I cant find anything anywhere about a pin stuck in test mode. Please for the love of god and all that is holy someone give me another clue to help me. Worst case scenario I am somewhat ready to throw in the towel. Can someone do the ground mods for me and take a look at my issue at the same time? I bet its an insanely easy fix. I mean it just happened randomly. nothing popped, blew, broke or anything. it just went into text mode somehow and never came out. Please let me know any tips and or if you are able to do the grounds mods for me and whats that's gonna set me back. Im not comfy doing all that yet. Looks a bit complicated and im still a newbie.